Lately I feel strange. My heart just signal my brain to write some old school food post. So I go and dig my archive (got more than 400 articles to write) and walla! Slip some where in one of the sub folders which tickle me to write about it. 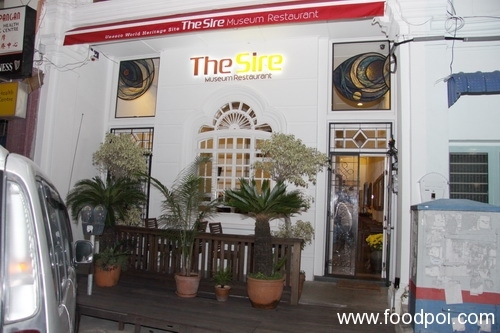 It was THE SIRE MUSEUM RESTAURANT which located in Penang. From the picture above you can see there’s another door leading much deeper inside right? 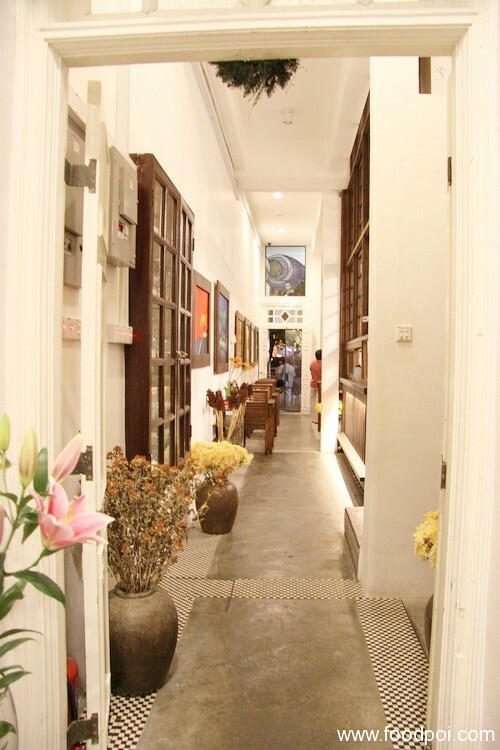 Beyond that area, we are not permitted to take photograph as all the items were antiques which showcased to public. I respect the rule here and do not shoot inside the showcase hall which you can see lots of stuffs from photos, personal items, furniture and etc which belong to Yeap’s family. The room were fantastic and very grand. The Sire in English term is used when addressing a “SIR” in UK. 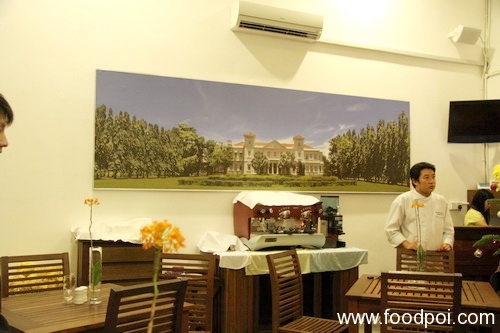 Same like we address a DATUK in Malaysia.This restaurant’s food is manage by the same management as Feringghi Garden which famous for Western Foods. 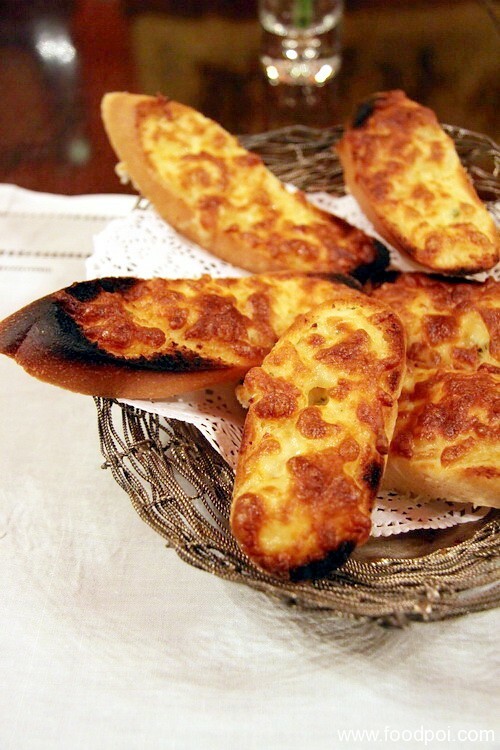 It taste quite good when it is taken hot. I just couldn’t resist the color when they served it. It is crunchy at the outer layer and soft in the inner part. Nice! This mushroom taste real good. Every bite will have a strong mushroom taste and the juice inside rush out upon bitten. 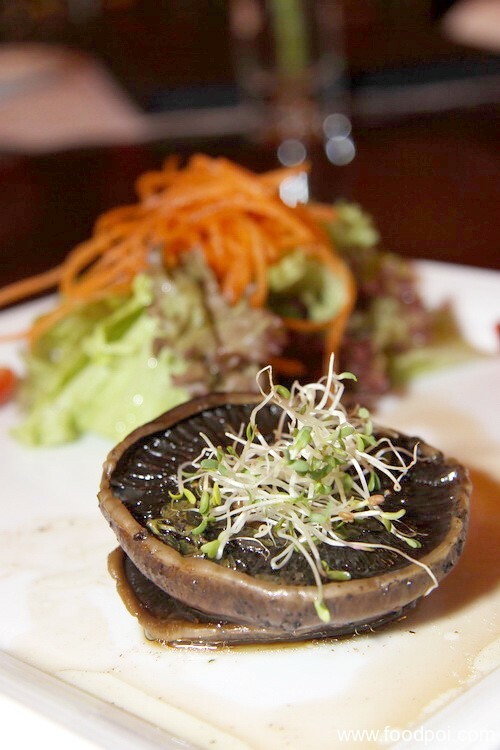 This is served with balsamic vinegar as the mushroom is tasteless in nature. Nothing much to comment on this dish as the piece of meat were rather dry and not juicy enough. 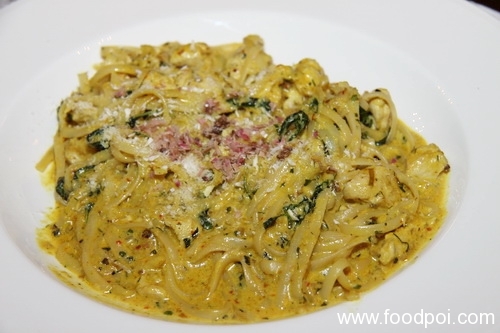 The Golden Linguine, was a fusion of Western and Asian flavors. 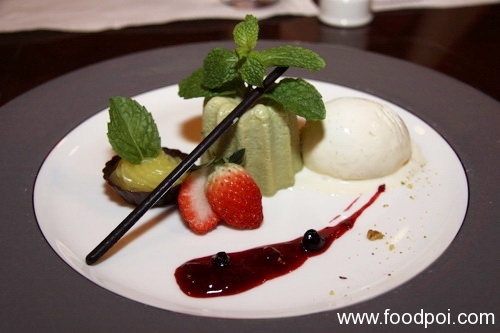 The sauce had the aroma and taste of lemon grass, Thai basil, curry and lime. This is the first time I had my linguine cooked with curry powder and the taste were somehow a bit weird for me. 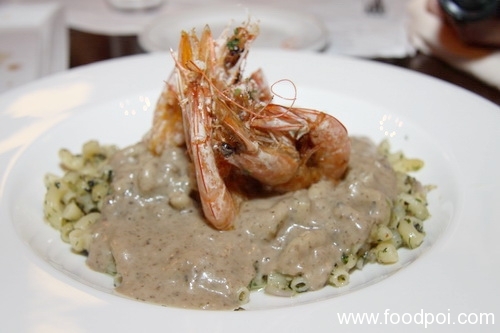 The macaroni were cooked Aglio Olio style and then laden with special mushroom sauce on top. Then there are 5 medium sized fried prawns on top. The taste not bad. I quite like it. 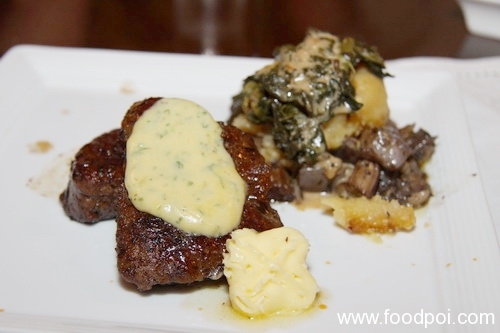 Two piece beef tenderloin well done served with mash potato, grilled aubergines and spinach. It came together with Bearnaise sauce and butter. 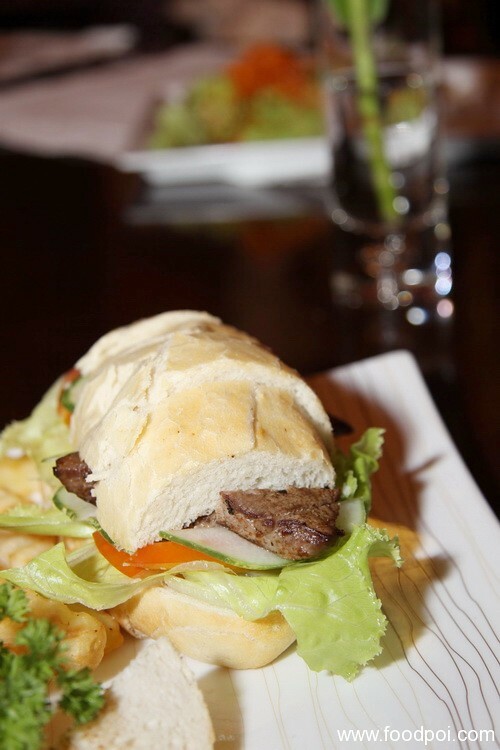 We try both and this dish is great! 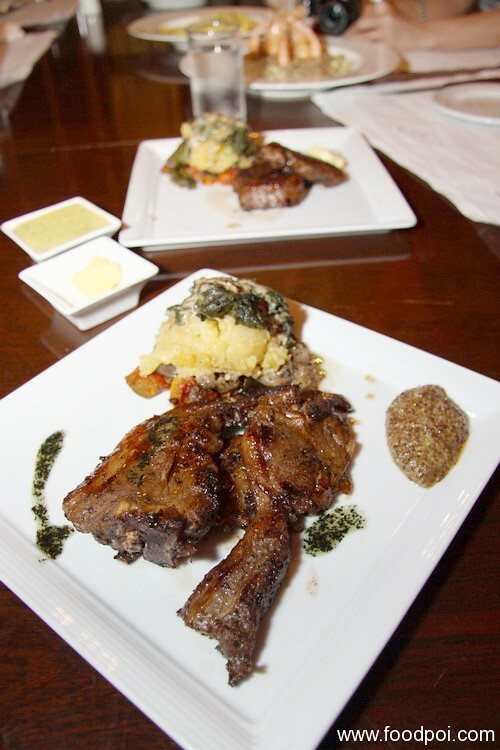 The Bearnaise sauce is made of clarified butter, egg yolks flavored with tarragon, shallots, chervil and vinegar. The mash potato that came with the medallion worth a mention also as it came with some chunks of potato rather than all mash up. Creamy and smooth texture with something to bite on. 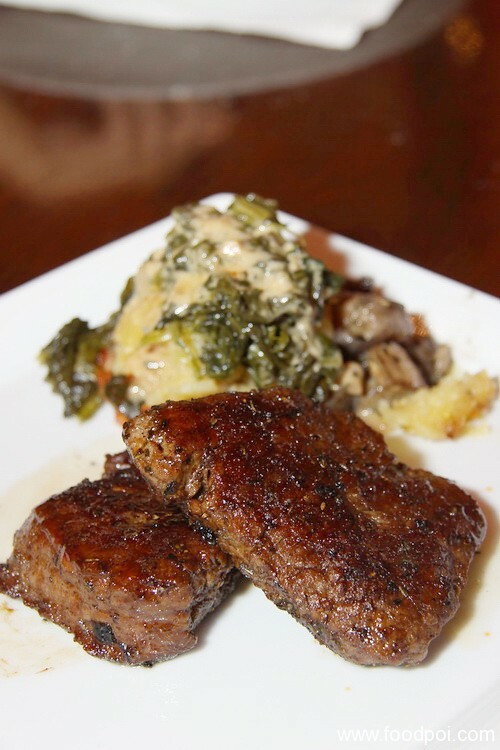 The meat is tender and juicy, the fats were caramelized under the cooking heat. Taste like Char Siew! It was good on its own without dipping into any of the accompanying sauces, the whole grain honey mustard and mint sauce. The same mashed potato from the medallion accompany the loin chop. 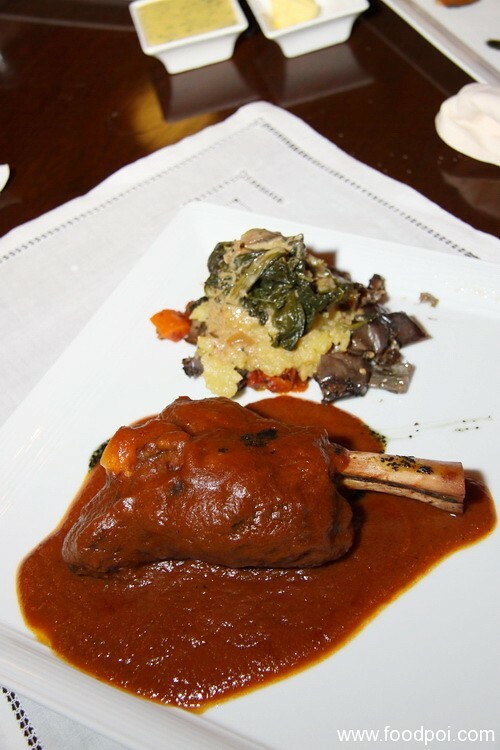 The lamb shank sauce were added tomato puree which spoiled the taste. Normally BBQ sauce is sufficient and according to CK, this is different from the one she had last time. 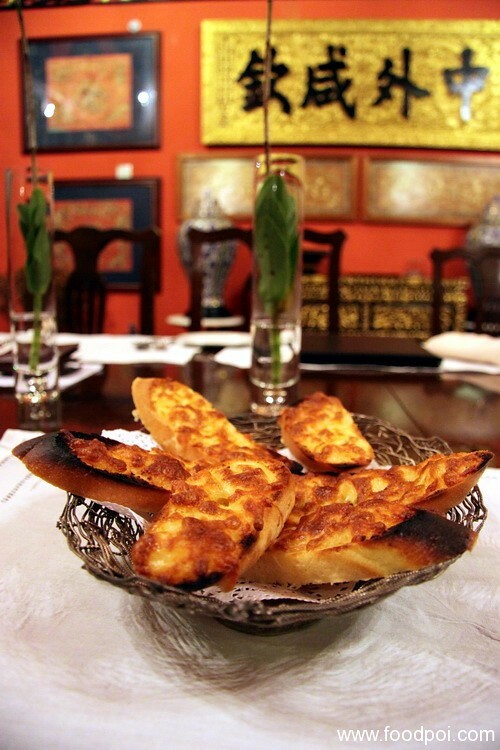 All the dishes above were circulated around the table to try out all the taste. It was fun eating it this way. Lucky we were seated in a VIP room or else people will think what are we trying to do can see all the plates passing around. This Tiramisu doesn’t taste like the normal one which I had. It is hard. 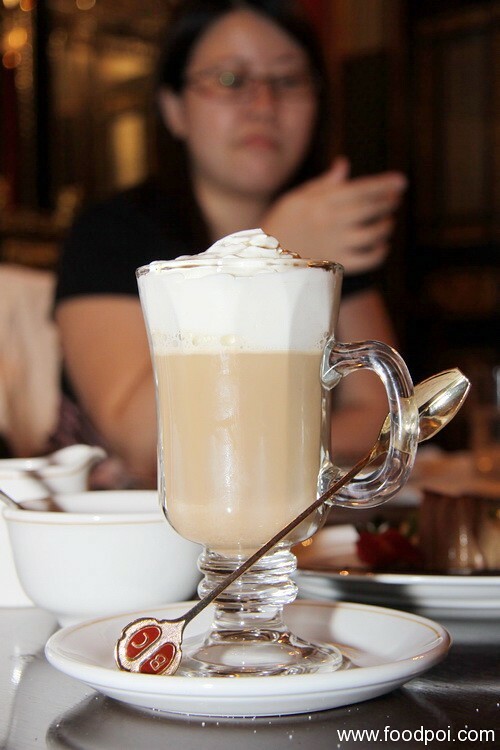 Bailey’s Coffee – RM19.80 This is good! .-= Chong´s last blog ..In Sabah – Day 2 (Part 2) =-. 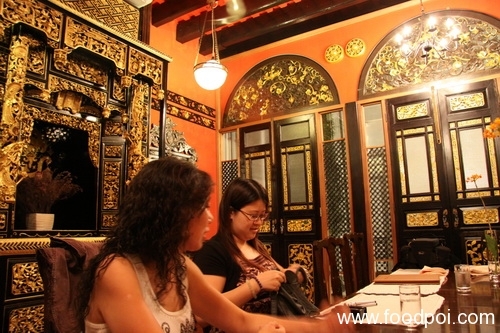 Plan a trip to Penang lo …. 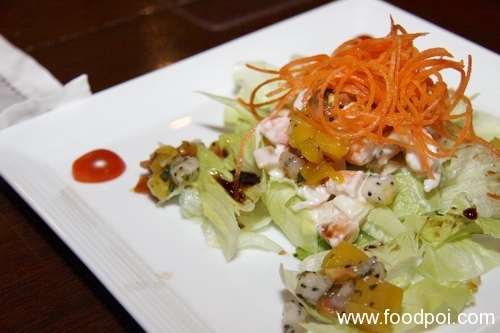 .-= allie´s last blog ..Ryoma Japanese Restaurant | Penang Restaurant =-. .-= Little Inbox´s last blog ..Buffet Lunch @ Miss Maud Restaurant =-. 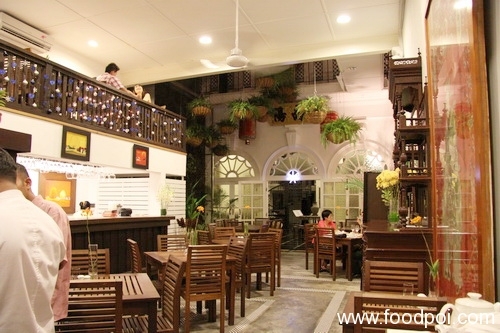 nice place to dine….te macaroni looks quite good…howz the special sauce taste like? mainly mushroom? 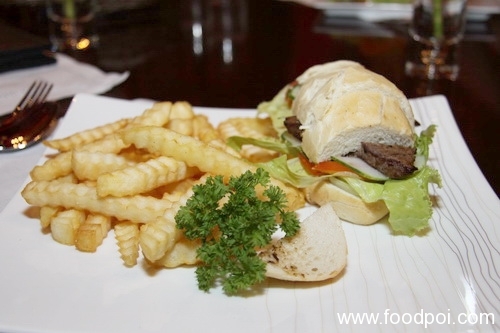 .-= SimpleGirl´s last blog ..La Manila Cafe@ Mid Valley =-. 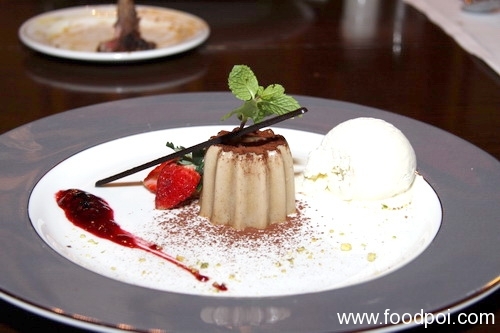 Thank you for another great review with pics & GPS coordinates. 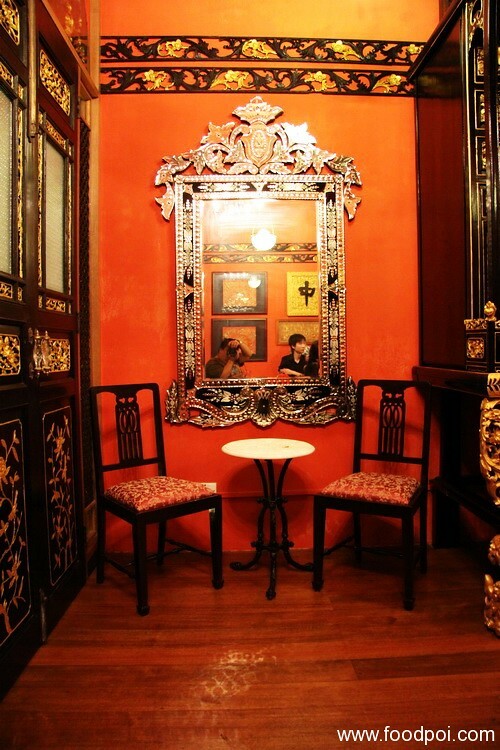 .-= gill gill´s last blog ..Coming Penang Floggers Gathering in August at Vintage Bulgaria =-. I should write this 6 months ago. Ask Sunny treat you when he got class there lo …. 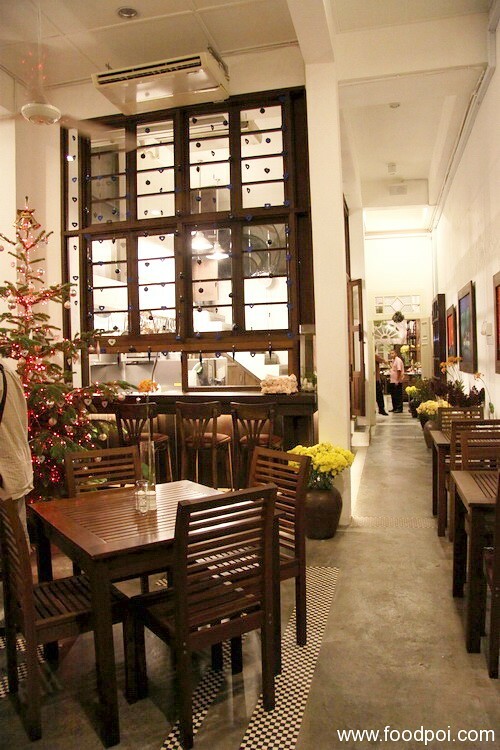 A very nice restaurant with nice interior…. .-= Selba´s last blog ..Martabak Mini (Mini Pancake) =-. Long time did not go back liao. 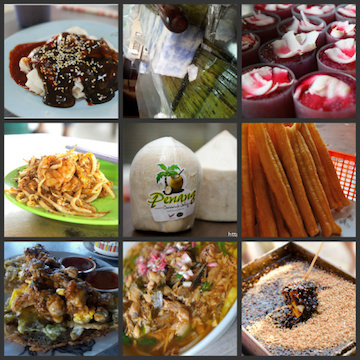 .-= FoOd PaRaDiSe´s last blog ..Sungai Pinang Food Court =-. Didn’t see you write about it? 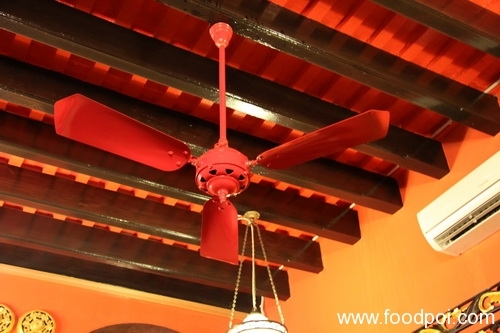 .-= New Kid On The Blog´s last blog ..Straits Kitchen Restaurant =-. 6 months backlog – food quality may have deterioriated. My first two times at Sire were definitely impressive ones. BUT not for the 3rd and 4th visit. My first visit 4th,Dec08 for dinner (http://cariso-food.blogspot.com/2008/12/dinner-sire-museum.html) – good! This is my 3rd visit on 1st Jan 09 – bad ! (http://cariso-food.blogspot.com/2009/01/disappointing-lunch-sire.html) , later on in Feb 4th visit, I brought another 7-8 friends there, the food was so bad that I didn’t even wanna blog about it, they all said it’s beh khi! I was soooo sad. 🙁 My colleague also went twice, first time he was impressed. Second time, he said disappointed, asking me”chef changed ah?”. It seemed like the quality is very inconsistent. .-= cariso´s last blog ..Double Good Hong Kong Style Roasters (??????????) Opening Promotion =-. OMG! It really that bad oledi ah …. being named as fine dining restaurant by tourist board some more. oh yeah! i rmbr this place. from the other posts long ago. .-= J2Kfm´s last blog ..Chinatown, Bangkok – Night and Day =-. Like cariso mention. Not consistent. .-= iamthewitch´s last blog ..Convocation at Nikko Hotel =-. 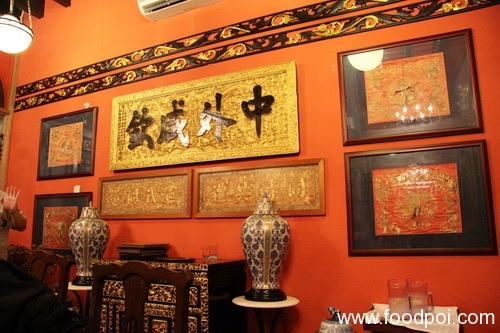 It is hard to notice this restaurant as not many know about it. 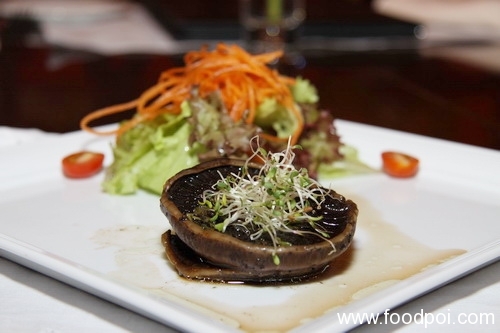 .-= xin´s last blog ..Going French with Chef Jerome @ Le Bouchon Changkat Bukit Bintang =-. wah… very backlog leh. I think we can rombongan for another visit to see if the standard still there? Nvr been there.. great pics as usual Ken! .-= thenomadGourmand´s last blog ..Nasi Beringin, Kampung Baru =-. .-= mimid3vils´s last blog ..Red Mania =-. the food looks yummy but dunno if it’s still up to standard now. How does bailey coffee taste like? 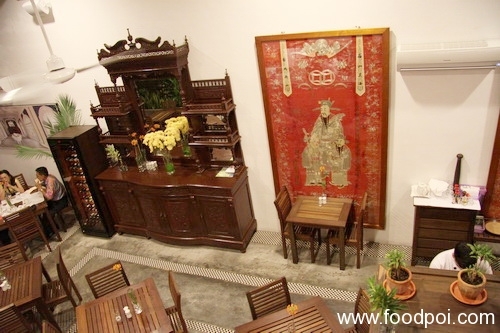 .-= taufulou´s last blog ..Dim Sum, Luk Yu Tea House @ Starhill =-. Can I have The Sire restaurant address? it is as the last page.